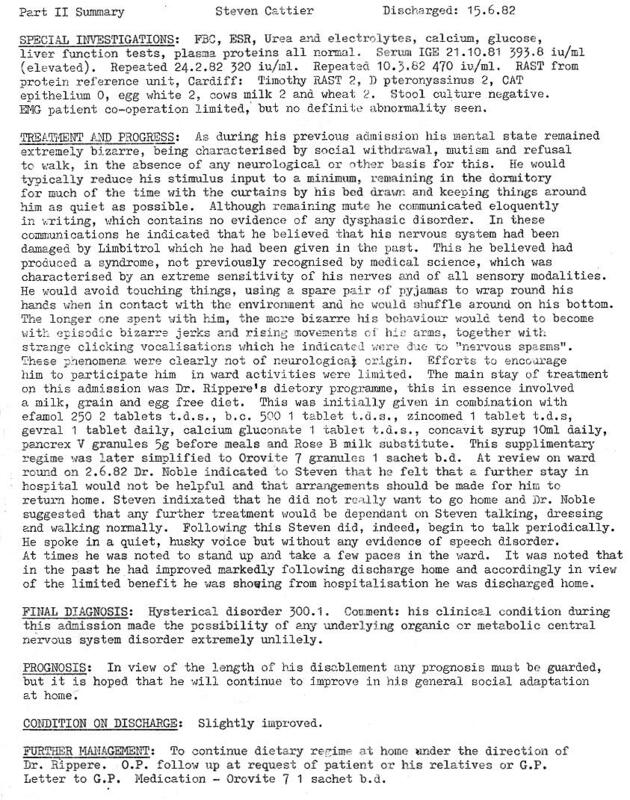 The bizarre jerks etc were symptoms of the neurological injury but the doctor disbelieved it. I started to speak during the last week of my hospital stay because I improved when I touched rough paper which appeared to be responsible for it. Owing to the fact that there was hardly any nerve fuel to allow me to to touch rough textures, touching rough toilet paper altered the nerve damage somehow to make me able to speak a bit whenever I became sufficiently interested in doing so and then it was by muscle spasms that my speech mechanism functioned, and I could guide speech to a certain extent to speak mainly accurately the thoughts I wished to communicate. It has been the same ever since. When I touched the paper, I think electric type shocks could have flowed through my body similar to the ones experienced when coming down with tonsillitis. I have suffered from them at other times whenever the nerves have had a tough straining. Before that I used to speak occasional gibberish by muscular spasms which sounded like foreign languages. It was on the evening I started to speak that I read out aloud a newspaper story to a fellow patient concerning the Falklands war. He said I did it well correctly pronouncing the Argentinean names such as Galtieri as I had heard them on TV during the previous weeks. My intonation was instinctive and automatic. I also stood up for a couple of seconds around that time which was a sort of muscular spasm owing to the neurological injury. The 'clicking vocalisations' I guess refers to the gyrations of my jaw from side to side for several times on each occasion owing to muscular spasms from the neurological injury. 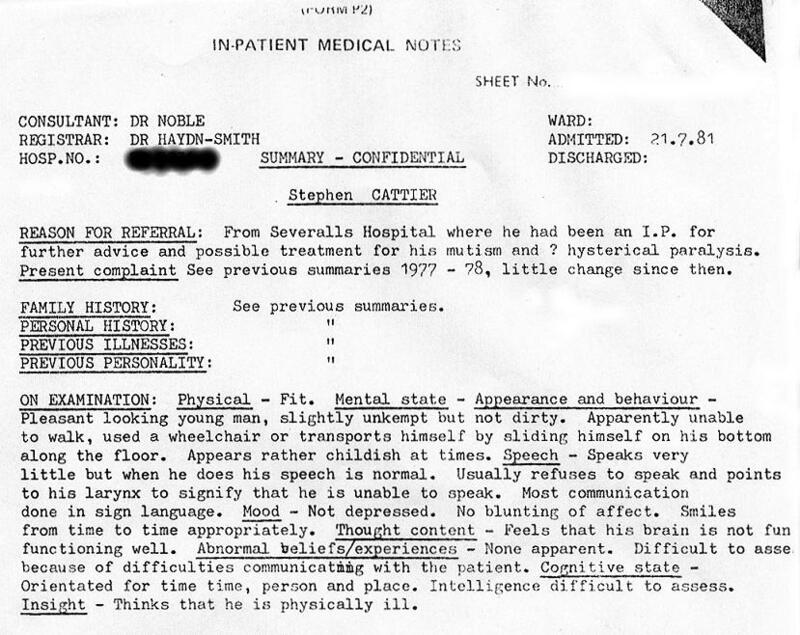 The reason why I did not want to be discharged home in June 1982 was because I was not correctly diagnosed. No doctors were at home but were in the hospital. Dr. Peter Noble had wanted to discharge me the previous September but I refused to go then for the same reason and so had months of indignity crawling around on the ward's floor at first* with a sheet wrapped around me because the relapse of August 1981 from two weeks of diazepam which damaged me more had made me unable to wear clothes for quite a while afterwards. That benzodiazepine (basically half of Limbitrol) had made my knowing nerves worse you see and so they had no fuel in them to function safely at all if I knew I had clothes on. Consequently, really *at first I was actually unable to be covered by anything at all at times but then could get about on the floor wrapped in the sheet and later I wore pyjamas as the nerves had improved. Up to taking diazepam in August 1981 I was getting about in a wheelchair clothed and was speaking a little.